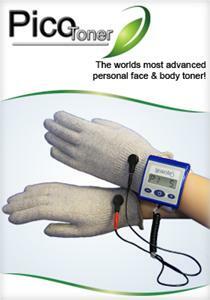 The Neurotris PICO Toner™ rejuvenates the natural “glow” of youthful hues to improve and return a youthful appearance. The NeurotriS PICO Toner™ is the only hand held microcurrent device intended for home use that uses personal Sculpting Gloves™ and or probes. Easily tone and tighten the skin under your neck or just as easily treat other areas of your body and improve tone, texture, and appearance of the décolleté, arms, legs, buttocks, and more! You also have the option to treat your hands and face at the same time!The Neurotris PICO Toner™ rejuvenates the natural “glow” of youthful hues to improve and return a youthful appearance. The NeurotriS PICO Toner™ is the only hand held microcurrent device intended for home use that uses personal Sculpting Gloves™ and or probes. Easily tone and tighten the skin under your neck or just as easily treat other areas of your body and improve tone, texture, and appearance of the décolleté, arms, legs, buttocks, and more! You also have the option to treat your hands and face at the same time!